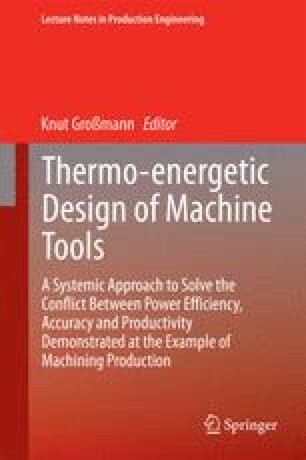 This paper summarises the current state of project research focussing on the energy model for milling processes. The general methodology of heat flux determination is described in detail. An analytical temperature distribution model that has been engineered in a subproject is presented as an initial result. The potential theory provides complex solutions for the differential equation of thermal conduction that make available temperature field and heat flux field at the same time. The models were validated by means of the temperature fields measured. An online calibration method combining an infrared camera with a two-colour pyrometer was developed to ensure the quality of the captured data. Finally, the principal paradigm of determining heat fluxes from the temperature models is briefly introduced.